January 20, 2016, 5:43 PM · The New Century Chamber Orchestra announced Tuesday that Nadja Salerno-Sonnenberg will step down from her role as Music Director following the 25th anniversary season in 2016-2017. Appointed in September 2008, Salerno-Sonnenberg led the San Francisco-based New Century through eight seasons. Through her leadership, the orchestra founded a "Featured Composer" program, commissioning a total of eight new works for string orchestra; embarked on three national tours; made three live recordings on Nadja’s own NSS music label; and partnered with arts organizations such as the San Francisco Opera, San Francisco Girls Chorus and Chanticleer. The announcement follows Salerno-Sonnenberg's recent appointment as the leader of the newly formed Resident Artist Program at Loyola University’s School of Music in New Orleans. Salerno-Sonnenberg, 55, will continue as Music Director through 2016-2017 as New Century searches for a new music director. 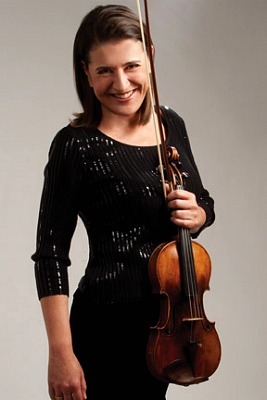 Well known as a concert violinist, Salerno-Sonnenberg’s career began when she won the 1981 Walter W. Naumburg International Violin Competition which she followed up two years later with an Avery Fisher Career Grant and later in 1999 the prestigious Avery Fisher Prize. Nadja has released more than 20 recordings on EMI and Nonesuch labels. Recordings and DVDs with New Century include From a to Z (2014), On Our Way (2012), Live: Barber, Strauss, Mahler (2010), and Together (2009).